That exhibition even included several bottles of McQueen’s fragrance Kingdom from 2003, which made me regret not buying my own bottle when I had the chance. I’m still consoling myself by looking at the Kingdom advertisements photographed by frequent McQueen collaborator Nick Knight…and, naturally, I’m wondering what this ad’s possible significance and source of inspiration could have been. The grouping of the models—actually just one model, Louise Kasprik, multiplied and montaged—reminds me of a photograph by Philippe Halsman portraying the artist Salvador Dali next to a giant, trompe-l’œil “skull” composed of seven female models. Knight’s grouping for McQueen also seems to include seven figures. The most similar section is the central top body, shown frontally with arms spread, below an arch of other limbs. The figures aren’t fitted together precisely as Halsman’s were (with feet lined up as “teeth”! 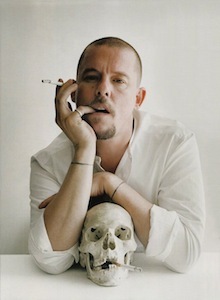 ): if McQueen and Knight were indeed thinking of a skull, they must have decided to convey the idea more subtly. Then again, there’s the bottle for Kingdom, which is shaped like an inverted heart. Kingdom’s packaging was even inscribed with a line from a poem by Jorie Graham: “Pierce my heart again.” Could the cluster of models with shadowy spaces between them allude to the human heart, with its curving walls and chambers? 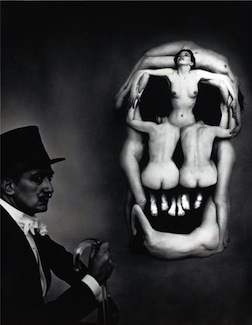 The Halsman-Dali photo-collaboration is titled In Voluptas Mors, which translates as “In pleasure, death.” The visual tradition of the memento mori is an ancient one, and the potent juxtaposition of a lovely young woman and a symbol of death isn’t a new idea either (just ask Edgar Allan Poe!). 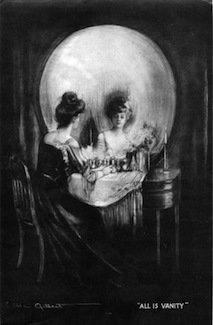 Another favorite example of mine is this illustration of 1892, titled All Is Vanity, which transforms a Belle Époque lady at her dressing table into a grim death’s head. In other words, there is a pictorial precedent for this symbolic mix of beauty and foreboding, vitality and decay, especially as embodied by a young woman (or women) choreographed in just the right pose. 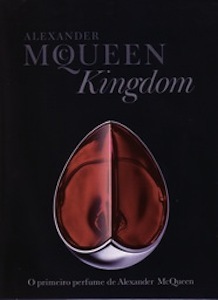 We’ll never know the exact origins of Kingdom’s ads in McQueen’s imagination, any more than we’re still able to purchase bottles of Kingdom at Sephora, but at least we’re left with a typically McQueen sense of slightly perverse enchantment and mystery. That’s certainly more than we can say about many perfume advertisements of the past decade. Images: Kingdom advertisements via Parfum de Pub; Philippe Halsman, In Voluptas Mors (1951), via Wikipedia; Charles Allan Gilbert, All Is Vanity (1892), via Wikipedia; Alexander McQueen photographed by Tim Walker for British Vogue (2009). To see more posts in this series, see here.